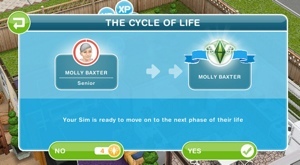 A lot of people find the life dreams concept confusing to understand, this guide will give you step by step instructions on how to give your sim a personality, completing life dreams, collecting, passing on or using orbs. 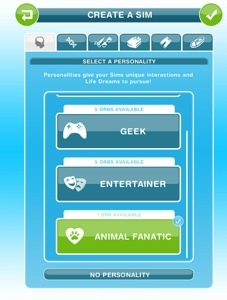 The screen will appear straight away once a sim has aged for you to select a life dream, either select one and click OK or if you click NOT NOW, then you can go to the life dreams tab, and select choose a life dream to choose from a new list of 3 dreams. A life dreams symbol appears on the action once you have selected it as your life dream. So you know which ones will increase the life dream! The green circle around your sim is the timer, once it gets to red that stage is almost up! Once your senior has completed their life dream it will say fufilled life dream in the menu. NOTE: You cannot give their orb to another sim until that senior passes on and leaves it behind. Now your seniors can plant and enjoy the rest of their life or you can end their life early too. Then click advance, it is free if they completed their life dreams! Then the grim reaper will come and end their life, leaving the orb in their place. Your first sim will get a bronze orb, giving it to another sim now gives that second sim the chance to get it up to a silver, then a third sim can get it to a gold and a fourth sim to a platinum. 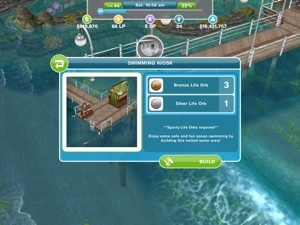 If you want to build the arcade and your first sim got you a bronze geeky orb you will need to give that orb to another sim who can then get the orb to a silver, then you can get a third sim to get a bronze geeky orb and the arcade can then be built! 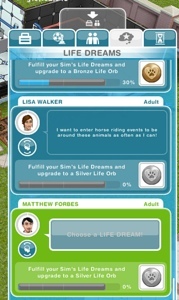 If you wanted to build the pet park I would have 6 sims all at once working towards a bronze orb, once 4 of them have completed their life dreams they can then be passed onto 4 new sims to get them to a silver. The 2 bronze ones can be stored until needed. Wondering how many orbs you will need for each place? click here! I hope this has made it a bit clearer! Still confused? Give my Life Dreams Frequently Asked Questions post a read! Hello magic! I would like to know, I have so many orbs I cannot use them anywhere (I mean I dont want to build anythıng on the fun park because it always asks for silver or platinum) Can I use my orbs which are in the inventory for slow down sims aging? Like pausing? For example when my sim will be preteen-to-teen, it just makes me an offer using LP to slow down the aging! When ı spend lp, my sims will not get to teen. But it doesnt make me choose using a life orb? What do you mean flashing on and off? Are you trying to download your cloud data? Sorry again if I missed something. Was there an update (after the magic one)? It used to not be possible to age a senior early so since they have updated it I never tried to do it again because I didn’t think it would work, but now I have seen that you can so the post has been changed, thanks for the information. No problem. 🙂 I thought it may be because the Grim Reaper always hangs around because of those two dying Sims (with the exclamation marks over their heads)… I never knew they removed the feature, but it’s defo back now. Hey there! Thanks for all your info! I just finished this quest and am trying to juggle these life dreams. A couple of questions for you….. 1. If a life dream is not complete in a life stage, can the next life stage catch it up? I made the mistake of picking drawing animals on a chalkboard for one of my and the 40 minutes is not working out too well. 2. Is it worth it to assign my adults to a personality? Is there enough time? 3. It seems like a lot to keep track of….will it get easier as I get used to it? Thanks much! Hi can preteens have life dreams if so can you give an example? Yes they can, all life stages can. Something like I want to go to elementary school everyday. my life dream is to enter as many horse riding events to be around these animals as often as I can…how do I do that? I’ve just now gotten where I finally have 3 platinum orbs that are not needed for building/quests. I have been orb farming since the Life quest started trying to catch up the beach, arcade, carnival and pet park. I am ready to make some sims that will not die finally! I’m not sure how the platinum orb works. If I give the orb to a teen then will they will stay a teen forever? What happens to the platinum orb if I want the teen to now be an adult forever? I’m guessing that I can only pause once and should pause the age where I want them forever? Have you used any platinum orbs to pause aging? They take so long to get I don’t want to mess it up! Thank you for your blog. It’s been a great help to me in playing the game. Actually, they continue immortal after aging again. Just fill up their life dreams and allow them age for free. I did this with a preteen and she is now an immortal teen! Hello! My preteen sim’s dream is “I want to go diving! I want to be as good as Jacques Simsteau…”. I send him to the Swimming Center and make him dive but the life dream won’t advance. Help! What can I do? Does it have to be in a house? have you tried the longest option? Hello. İ had built the arcade gamer place on the mystery island begore. Now İ had a several more geek orbs but İ can’t use them to build the game options. The orbs can be seen in the inventory but they can’t be ticked. İt seems they’re locked!! What should İ do? I just began the life dreams legscies quest and for some reason when i open the wardrobe there is no tab to add personality, even when i begin with a new baby? There are only the two tabs, one with free items and one with shopping items? Only my one elder sim who was part of the quest and was tandomly assigned a life goal has one. For example, one of my infant is ready to age up (has bday cake above head) and the prompt is that he doesnt have a life goal, i cant assign him one because it wont even let me open the wardrobe with him? Hi! ^^ I have a question regarding those orbs. Is there any way to obtain thems by other means than killing my sims? Can I say, buy them from rl money like the currency packs, paus all my sims with them so they never die or age, then buy more to build those other things? Or do you recommend me to just not complete the life time legacy quest? Its been in my queue since august or somesuch and I just refuse to finish it because i dont want my sims to die(i thankfully googled it in time to stop myself from finishing it before it was too late, otherwise I would’ve had to start over with a new game and that would’ve been pretty infuriating), but if I could get them without deading my sims, it might be worth it as it feels bitsy annoying to have so many things locked away. Or is this aging nonsense the only way? I really dislike the aging/dying bits of sims and i always turn it off in the computer version, so i really dont want to risk finishing that quest it if there’s no long term way to turn it off. Also, thanks for this awesome blog, you’re doing such great work here! Hello! 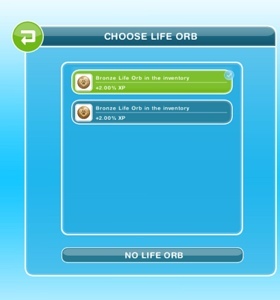 Unfortunately killing off your sims is the only way to get orbs, I think being able to buy them would be a great idea though! 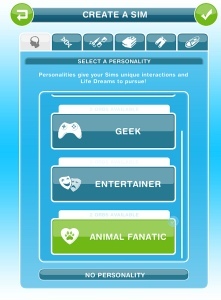 Hey, I’m quite new to the life dreams update! 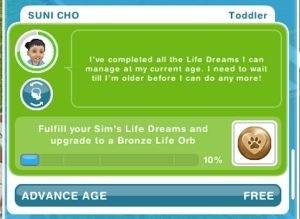 I have a bronze life orb left behind by one of my sims – do I have to give it to a baby or can I give it to an adult without resetting their existing life dream progress? 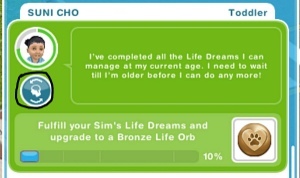 You can give it to any sim who doesn’t already have a life dream or it will reset their progress, just go to the wardrobe, select personality and choose the orb and they will be able to work towards a silver orb. You have to do the quest before you can give your sims personalities. How did you give it to them? The way you do usually or by using the pause button on the age controller? Help! I have four seniors who have completed their life dreams, but not sure how to “send to the afterlife”. I know to eliminate a sim you hit the little red button that shows up when you click on them, but if I do this will I lose my orb? If so, how do I safely send them to the afterlife & retain the orb they earned? 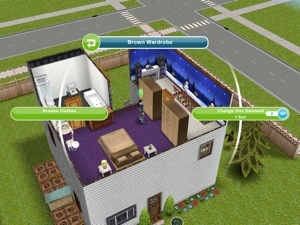 I have added pictures to explain it to this post, you don’t lose the orb because you have to end a sims life to get the orbs, it will just be in the place of your sim and then you can store it. Hi there! 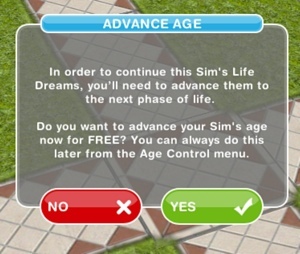 So if I understand everything correctly, if I want all of the Sims I have created prior to aging a sim (19), which activates the automatic aging, I need to add 4 Sims I would complete life goals for and then essentially sacrifice in order to earn a platinum orb to save one sim permanently. As long as I do nothing with any of my Sims I plan to keep while I go through the process of earning these orbs, will they stay their same age? I’ve just finished the life dreams and legacies quest and they said it’s best to give the orb to the infant. Almost all of my sims are adults and I’ve only got one infant and two toddlers. Would I still be able to finish the life dreams if I gave the adults personalities now? Or should I just have lots of babies and start from there? Thank you! Thank you! I’m just starting out and I still a little confused. Your blog is a great help! 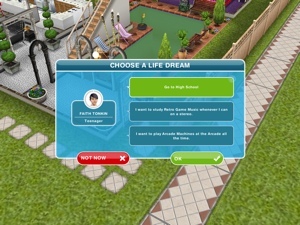 Can I ask if doing life dreams will take all of your sims’ time? I always have my toddlers do the playhouse hobby. Does that mean I won’t have time to do them anymore because you have to keep fulfilling their life dreams? If you gave someone like a silver life orb but then change their life dreams say to another life orb or another category (say geek to entertainer), would you lose the orb (geek) ? You mentioned you’d lose progress but would you lose the entire orb itself? The grimm is scary i freak out when i saw it flying to took my first elder life, its like nooo you can’tttt, so it will always show up everytime my sims die? 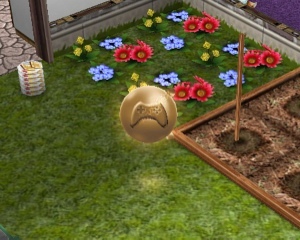 Can my sims give it orbs to other sims before it die? From the inventory? 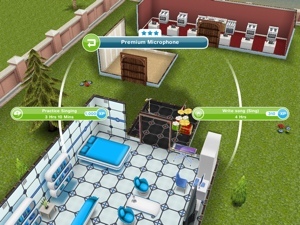 I noticed after I finished the life dreams and legacies quest, I only needed simoleons to add a baby instead of 3 LPs. It cost me 45,500. Does it really change after you have done the quest? 1 of my elderly sims just moved on to the afterlife in the restaurant leaving his bronze orb behind. Im trying to repair the restaurant for use but my sims cant get past the orb and I cant get my inventory up since im not in a sims house. How do I get it or at least move it? you should just be able to click on the orb and a pop up with appear, then you can store it or give it to another sim. How do you get more bronze orbs? 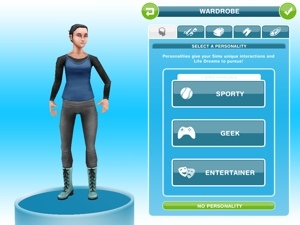 give sims a personality and complete their life dream. The reaper didn’t leave an orb for a senior it took. It was the 2nd Sim. Do they always leave an orb? Did I miss something? I received a sporty silver orb from the first Sim it took.. Thanks so much! Your blog is so helpful, this is my first comment. Ok, he didn’t have one yet. Thanks ! When you build the arcade , beach etc does it increase your town worth ? Hello! First off I want to say your blog is amazing & helped me out So much! Now on to my question ((LOL)) I have an adult sim with a gold orb, however I would like for her to live as an adult indefinitely. I can’t do that, can I?? Because she already has the gold orb. I can’t find the personality tab. have you complete the life dreams and legacies quest yet? then you won’t have the personality tab yet. What do you think an estimated time to fulfill a life dream is if you keep doing the task back to back? When the timer turns red, can I still have the sim stay at that current age? Or will the sim age up automatically? they will age automatically unless you use LPs to reverse them back to the beginning of that stage. 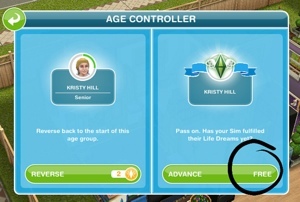 You can use platinum orbs (as explained in this post) to pause a sims life or use LPs to reverse back to the beginning of that stage but otherwise after you complete the quest your sims will age automatically. Can you work on your life dream goals in neighbor’s towns? Thx 4 info on this quest where sims age and die. Because of ur info I decided to not start this quest. Im enjoying my game as is. If I give a toddler, preteen or teenager a platinum orb will they stay at that stage forever? I just want to know if its possible before I use the orb. I read through a lot of comments but couldn’t find this one. If a senior sim has completed his life dreams can I use the upgraded orb to build something without killing the sim off? When in the building screen it seems I know I can take the orb but it warns me that the orb won’t be upgraded. Thanks again. Your website is amazing. I don’t have an orb inventory. A bunch of my original sims died off in the quest, which I have completed, and I have no way to see where those orbs went- but when I try to build anything, it always says I have zero orbs. Sad times. I’m updated as much as possible, and playing on an ipad 2– any ideas? I have a bronze orb that I can’t tap on to give to a SIM or store. Any advice? It seems like a glitch. It’s at the newly built campground in the picnic area. I’m not sure really, have you tried restarting your device? hi thanks so much for taking the time to write this amazing blog & replying to hundreds of questions. 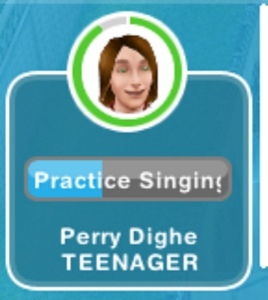 I was wondering if there’s anyway to change the life dream of a sim without resetting their personality and losing the orb they have started working towards? I have a teenage sporty sim, master dover and accidently aelected the surfing life dream. Ifi do this I will lose all her diving skills. Plus can only have one sim surfing at a time and already have another one doing this. This is so confusing. I’m not at this point of the game yet, and now I don’t want to get there. Do you still find the game worth playing? I feel like everything will get harder, since I have certain houses, jobs and hobbies for certain sims, and now I need to let them die and grow new ones. Is the game still as enjoyable? I have done everything you say for orbs yet when my Sims pass on I am not receiving any orbs. I’ve done their life dreams and they have been completed. But when they pass I get nothing. No orb pops up to put in my inventory.